Anne Brokenbrow, who lives at Hartford Care’s Stokeleigh care home near Bristol, stunned care home staff by making the unusual request on her wish form as part of Alive Activities’ ‘The Wishing Washing Line’ project. Police from Somerset and Avon Police teams were very happy to grant Mrs Brokenbrow’s wish with a meet and greet, friendly chat and a quick ride in their police car as a ride along experience. Alive Activities works in over 300 care homes and day centres across south and south-west England. 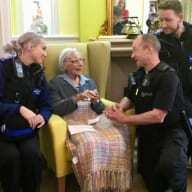 The post ‘It’s a fair cop!’ – care home grants resident’s wish to get arrested appeared first on Care Home Professional.